Devil's Den is located just west of Williston on Alternate US 27. Take I-75 exit 74 if you're going south or exit 70 if travelling north. Go west on Hwy 121 or Hwy 27 respectively. Once you get to downtown Williston (watch for speed traps) head west on Alternate Hwy 27. The road to Devil's Den will be about two miles past the shopping center (near the town water tower) on the right. Just look for the Devil's Den sign on the highway. Follow the road for about 3/4 of a mile and look for the entrance on the left after a series of curves. This is an underground spring inside a dry cave in central Florida. The remains of many extinct animals from the Pleistocene Age (2 million - 10,000 years ago) were discovered at Devil's Den, including the bones of early man, dating back to 75,000 B.C. 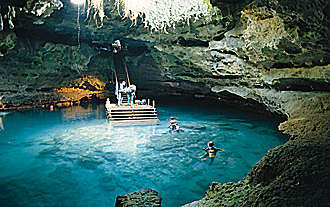 The year-round spring temperature of 72 degrees in the Den allows diving during winter or summer. On cold winter mornings you can see steam rising from the hole in the top of the dome. The early settlers called the place Devil's Den because of the smoke-like appearance caused by the warm water and the cold air during cold mornings. There are often classes here in the mornings using the platforms and heated pool. I suggest getting in as early as possible since any sediment stirred up by other divers won't settle for most of the day (due to such low flow). All the cave sections have been blocked off by chain link or rebar, but they are poorly maintained and have been pulled up by other divers. Do not attempt to by-pass these points. The big draw here is the numerous swim-throughs (you go in one hole and come out another opening). Price is about $27 and there are a few activities for non-divers such as fishing, volleyball, and camping. A few years ago, a large two acre concrete pond was created to be used for training, but ever since it has been opened, the visibility has been terrible due to the uncontrolled algae and is therefore fairly useless for diving (management claimed that would be able to handle it through the use of filters). This is a good site for open water divers who just wish to experience cavern diving once or to tell friends they dove in an underground lake. I have tried to get a map of the cavern and cave (before being blocked), but the operators do not seem to want to share information. Some people just try to keep everything to themselves. Click here or on the logo for the official web page.